Public assembly facilities are able to host many different events. They can often convert their space within hours to prepare for the next event. How is this possible? One of the primary reasons that they’re able to do this is because of telescopic seating risers. So, what are telescopic risers? They are a motorized seating riser that deploys or retracts automatically with the push of a button. If they’re made by a reputable manufacturer, they’ll deploy with pinpoint accuracy and will feel as solid as a built-in seat. This allows venues to easily provide extra seating for a multitude of events with limited demand on the conversion labor force. For example, we work with a facility in Melbourne that converts their venue 3-4 times per week that requires 6 people a couple of hours to move over 1000 seats from set up to storage. One day they can use the space for a theatre and then they can turn around and host a trade show the very next day. Being able to be flexible and host multiple different events like this is how they’re able to stay profitable. Having the telescopic risers helps them convert their space in time to be ready for the next event and allows them to have more event days in the facility. Sometimes they have just a few hours between events and this increased conversion speed is a necessity. This need for fast conversions and space flexibility is also seen in most arenas. They have the tendency to host different events from sports, to concerts, and open floor events like monster trucks. Each of these has different seating requirements. 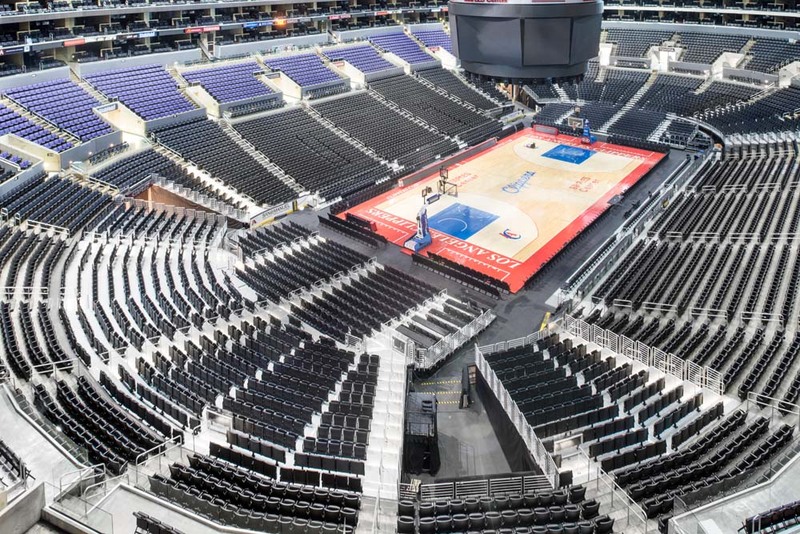 Concert sets may require seating removed from one end, the sporting events could require adjustments for better site line, and the open floor requires the removal of all the seating on the main floor. Telescopics are an integral part of allowing these changes to happen. 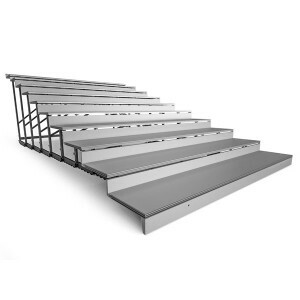 Telescopic seating risers have progressed throughout the years from systems that simply extended and retracted to systems that also adjust vertically (Dual Rise Seating Systems). Venues that utilize the dual rise seating system are typically dual sport arenas that require fast change-overs on a regular basis. The video below shows how the conversion process works for basketball and hockey. Prior to dual riser telescopic risers, two systems were needed to allow the best site lines for the different type of event. When converting between sports, one complete system would need to be removed and the other would need to be brought in. As you can probably imagine, this was not only extremely labor intensive, but it also required a lot of additional storage space. If you work at or are involved with a venue of any size, you know the value of your storage space. Having to constantly store a secondary telescopic system impacts that space and slows conversion times due to the movement of more equipment. The dual rise system makes it much more affordable and profitable for venues to host multiple sports.